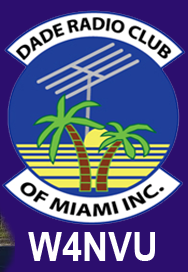 March – W4NVU – Dade Radio Club of Miami Inc.
Meeting was called to order at 19:35 with 23 present. We have a quorum. Julio and Miguel were not present tonight and Lloyd presided over the meeting and welcomed everyone. The meeting was not broadcast live on the air tonight from the EOC. There was testing being conducted tonight in another room. Everyone took turns and stated their name and call sign. Lloyd welcomed everyone again. The minutes were not posted on the website. They will be voted upon at the next meeting. Corresponding Secretary: Lloyd advised that there was nothing in the PO Box. Treasurer – Brianna is not present tonight. We do not have a treasurer’s report. Dues for 2016 are due. Please see Lloyd to pay your dues or you can pay them online. Ryan is in the testing room. Lloyd announced that our website is up and running. Hamboree – Lloyd announced that we have a location. It will be at the War Memorial Auditorium in Fort Lauderdale. We have tentative approval for the South Florida Section Convention for the 50th Anniversary of ARRL. Lloyd spoke about the vendors. He needs the help of everybody in the room and more. Emails will go out in April and May for positions available. We need about 50 – 75 members for staff. It is going to be big. It’s the first weekend in February – the 3rd and 4th – 2017. Miguel is not present for the Club Elmer/PIO report. Jason advised that there is nothing new with the Hambulance progress. Steve spoke about the ISS contact today with Booker T. Washington High School. Photos were shown of the event as he spoke. They made contact with Tim Peake. If you know of any group that would be interested to make contacts with ISS, please see Steve. The press did not show up. All of the kids will receive QSL cards. We were the 1001 contact. Congratulations!!! Brandon spoke about the MS 150 Break Away to Key Largo. We had just under 1100 riders. It was a great event and it was successful. He presented those that participated with a certificate. Lloyd also stated that it was very successful and no one got hurt. Everyone did their job. Congratulations to everyone!! John spoke about National Parks on the Air. His team was Julio, Alian, John and Noel. The events took place at Flamingo on February 28 and made over 400 contacts. There will be another one at Big Cypress this weekend and they are hoping to get over 400 contacts again. It’s the 100th Anniversary of National Parks. Congratulations to John and his team!! Steve spoke about Field Day. It will be the same as previous years at the Everglades Center, BBQ, etc. John will have a separate location with no amenities. It will be for operations only. Field Day will take place the last weekend in June – June 25 and 26. More info TBA. 147.000 – Carl advised no news. 147.760 – Ray advised that there has been some traffic. 220 – Julio is looking for a new site. Maybe in Aventura. Julio is not present tonight. 444.200 – Carl advised it works. D-Star – Gateway is back on the air and John is using it. Miguel is not present so there is no Emergency Committee Chair report. Brandon spoke about our Nets. He is the Net Manager. He needs more net controllers real bad. It takes ½ hours on Wednesday nights. Contact Brandon or Lloyd. Lloyd suggested to get on the net to test your radio. Lloyd announced that at meeting nights he will go through the sign-in roster to see those that have paid their dues. They will be receiving a new RACES ID for the Dade Radio Club of Miami, a lanyard and a bumper sticker. We had lost the ability to make ID’s and we now have a way to make them. He presented Carl with the first one and handed out ID’s to others present. If you are on the sign-in roster and you have paid your 2016 dues, you will receive your ID, lanyard and bumper sticker at the next meeting. If you are not sure if you paid, email Julio or Brianna. Ray announced that the 147.760 site may not be around much longer. Anyone that has access to a high building let Ray know. We need a site. Several suggestions were given by the members. Dave announced that we have one new Tech and one new General from testing tonight. Robert Hernandez passes his Tech and Juan Carballo passed his general. Congratulations!!! Hollis asked if the club could sponsor an Eco link repeater. Jason advised that we would need a site, computer, etc. Lloyd thanked everyone for coming. Lee made a motion to adjourn, seconded by Hollis. The DRC meeting was adjourned at 20:11.